The Island Guesthouse is a private, retreat style boutique accommodation. This elegant north-facing two bedroomed bach has large feature windows to let the outdoors in and a generous deck for BBQ's. The interior is contemporary with furniture designed by Simon James and featuring art work by local Waiheke artists. 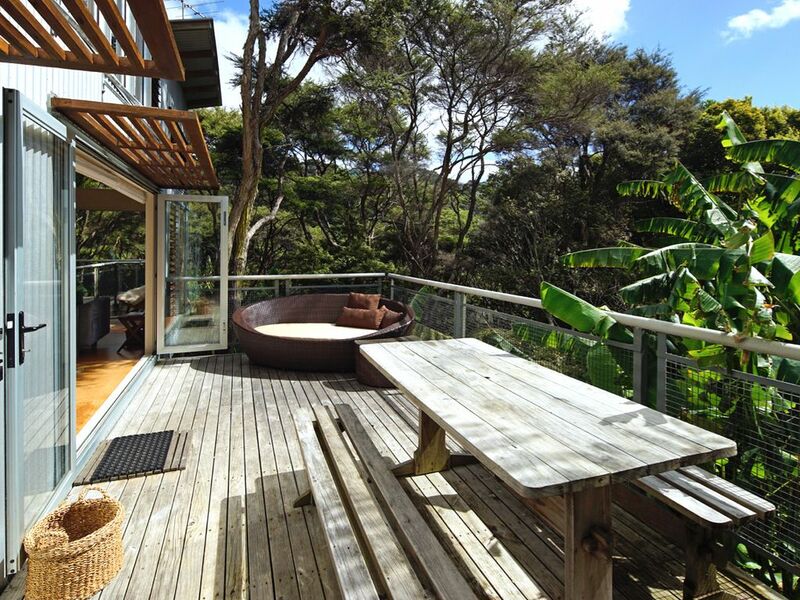 Modern and tranquil, this hideaway is a 3 minute bushwalk to the stunning and private Hekerua Bay and a further 5mins to Sandy Bay and Enclosure Bay. The Guesthouse is self catering holiday home. Located 20 meters from the road down a tropical garden path, this Island escape is perfect for a peaceful weekend away or a family holiday. The guesthouse has everything close at hand, Sandy bay is a short 2 minute walk away, or you can take the private at directly down to Hekerua Bay. Palm Beach and Waihekes other beautiful beaches, vineyards, cafes and restaurants are all within 5-10 min drive. Attractive property in the trees. Attractive property, enjoyed walking down to the beach. The kitchen dinning, living area good. Also enjoyed sitting outside on the deck area. But think the bathroom needs updating, and it would be good to have a proper place to hang clothes as only four coat hangers in one of the bedrooms. Excellent place to stay. Perfect for a family or couples. We loved our time here and look forward to staying again sometime soon. Lovely spot, perfect for relaxing tucked away from it all, but still so close to restaurants and wineries. Absolutely loved it! Beautiful house in the perfect setting, so peaceful - exactly what we needed! We loved the look of the property but we were a little surprised at the lack of set up for the price.. Only having 4 of everything was a nuisance as we had to hand wash between meals. Also the starter button on the stove needs fixing as do a light in the bathroom and the one outside. The mosquito situation brought on by the beautiful landscaping, probably requires more outdoor citronella candles, etc. For the price, you were missing some crucial niceties. The property was stunning. The location is very unique and facilities are well equipped. All in all it made for a very relaxing getaway.